might be used. For most websites, it’s about tracking (Analytics and remarketing), form submissions and email signups. Disclaimer: This blog post isn’t legal advice. If you want to spend money on legal language that almost no one will ever read, contact an attorney. 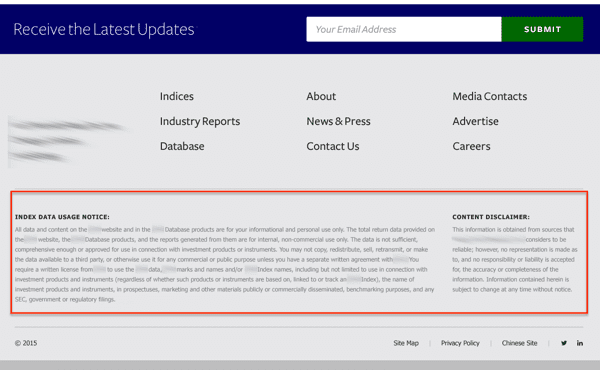 For websites in highly regulated industries, you may want to put the text right in the footer. If legal text is critical, adding it to your footer will make sure that you have maximum coverage. You’ve got the fine print on every page. 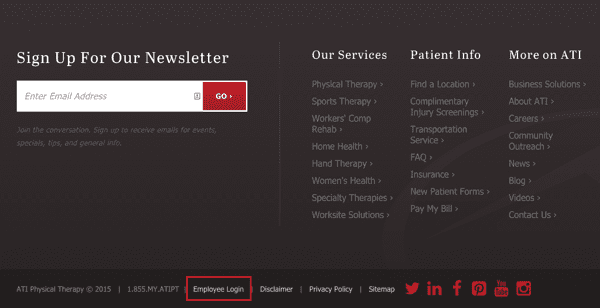 Visitors expect to find contact information in the top right of the header. It’s a web design standard. It’s also standard to find a “contact” link in the bottom right (or center) of the footer. This should be a link to the contact page with a contact form, not an email link. There are lots of reasons to use a contact form, rather than an email link. The form submission is easy to track as a goal completion in Analytics. The visitor may not be on a computer that they use for email. Forms send visitors to thank you pages, which can provide more messaging and calls to action. Forms send visitors auto-response emails, again, more messaging and CTAs. Forms can save submissions into a database in case email doesn’t get through. Forms can connect to marketing automation and other systems. Forms can ask specific questions and route submissions to specific people, depending on the answers. Email links are spam magnets. So leave that email link out of your footer! In fact, I don’t recommend putting an email link anywhere on your website. This website has great copywriting, but a contact would have been better than the email link. Place information is something that visitors expect to find in footers. It’s also a way to tell Google where you are, which is important for businesses with local customers. Linking to the map is a handy way to help visitors find you. When programmed properly, this map link turns into a big fingertip-size button for mobile visitors, bringing up the map app on their phone or tablet. Like the address, a phone number with a local area code is evidence to Google that you’re a local business. 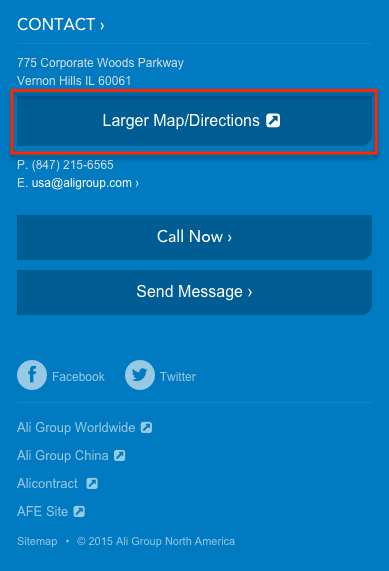 And like the map button, a phone number should automatically transform into a clickable button when viewed on a mobile device. Tap to dial! Here’s where your footer can rescue falling visitors. If they’ve made it down this far, they must not have found what they were looking for. Time to offer some more options. The last few years have seen a usability trend called the “fat footer,” which means adding more than just the standard items listed above, starting with navigation. Footers now often contain the same links you’d find in a “mega-menu” dropdown in the header navigation. But this doesn’t necessarily save a visitor falling down your page. Remember, these are visitors who didn’t find what they were looking for above. Check your “Site Search > Queries” report in Analytics. What are visitors searching for? What aren’t they finding? See the Report of Broken Dreams. Check your “Behavior Flow” report in Analytics. Where do visitors seem to want to go? Here’s how to find the top path through your website. Which interior pages need a search ranking boost? Learn to use internal linking for an SEO advantage. You don’t have to just repeat your main navigation. You also shouldn’t just add your entire sitemap. This forces visitors to dig through a pile of links. How’s that helpful? We love visitors from social networks. But we don’t love it when our visitors leave and go to Facebook, Twitter or YouTube. If they do… they ain’t coming back. That’s why our designers almost never put social media icons in website headers. 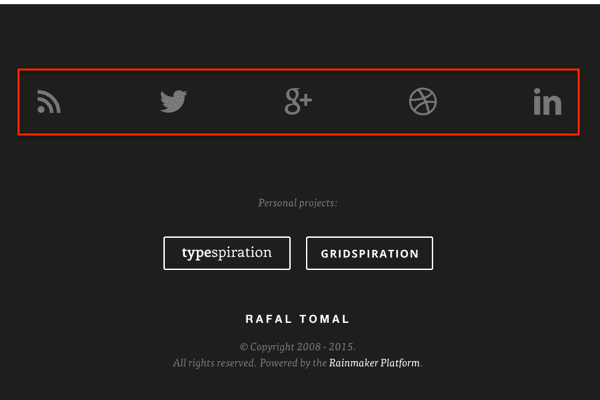 The footer is the best place to add icons that scoop visitors over to social networks. 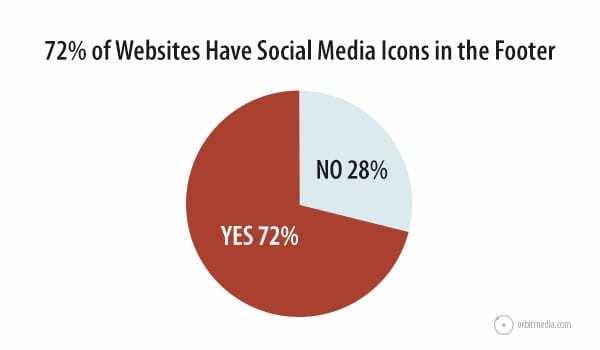 When we analyzed the top 50 marketing websites, we found that 72% included social media icons in the footer. Here’s a good example from Rafal Tomal. Some footers go beyond the icon and use an actual social media widget. These show the latest post from a social media network, embedded right in the footer. This makes sense only if you are active within that network and have solid editorial standards about what you’re sharing. Caution: If you use such a widget in your footer, social media posts will appear on every page on your websites. Especially risky if you’ve got an intern running your social channels. Applebee’s famously learned this lesson the hard way. The website footer has become a very common place to let visitors subscribe. 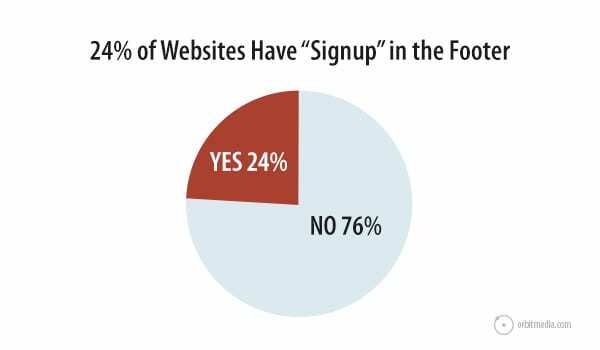 Our website standards study found that 24% of top marketing sites have a signup box in the footer. True, email sign ups are more likely to occur on a page where the visitor got value, such as a helpful blog post, it’s still not a bad idea to let visitors subscribe from the footer. Footer signup boxes should still follow email signup best practices, offering social proof (how many have signed up before?) and setting expectations (what with the subscriber receive? how often?). Not all visitors are prospects. Some visitors may be employees, partners, affiliate or resellers. If there’s a login area for these people, the footer is the best place for it. These people come back often and know where to find things. No need to use valuable marketing real estate in the header for them. A little login link in the footer is fine, like ATI does here. Another type of non-prospect is the press. Realistically, only a fraction of 1% of your visitors are journalists and editors. So don’t waste precious space in your main navigation with a press link. If someone from the media does happen to visit, they’ll scroll down and find it. If they didn’t find it in the header, in the content area or in any of the footer links, a site search tool is the ultimate safety net. Search tools are not as common in website footers as email signup forms, so if you use one, make sure it is clearly labeled. The Smalley Steel Ring website features a quick search tool for products, helping visitors jump right into the catalog from any page. If you really want to dress up your footer, add an image to it. Here’s a chance to add personality to the site. The Mason-Dixon Knitting footer features a picture of Kay and Ann, the two founders. Why not go for the full pedicure? Rather than one image, add an entire gallery. Experimental Sound Studio has a gallery of photos in the footer. Clicking a photo brings up the image within a lightbox. Images are another chance to reinforce the brand. This is a good place to use an alternate version of your mark or use your logo in a different way. The Center for Humans and Nature website uses the original version of their logo in the footer, where the header contains a simple, legible text treatment of their name. Logos are good. But why not tell visitors why you’re in business? The footer is an excellent place to plant your flag and tell ‘em what you stand for. 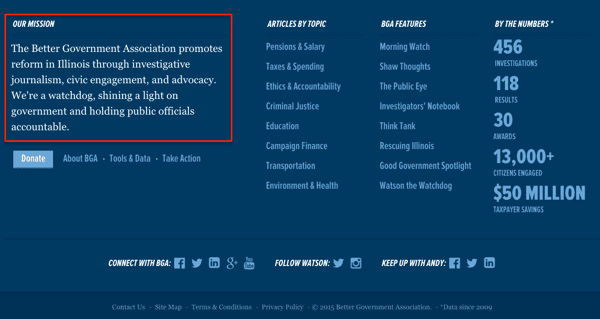 The Better Government Association website footer not only restates their mission but shows the impact they’ve made using numbers down the right side. It’s impossible to miss why or how they do what they do. Text in the footer is text on every page. So it’s an excellent place to indicate your relevance to Google. If you do include your mission, your value statement or an “about us” blurb, use this as an opportunity to include your primary keyphrase. Caution: Footer text for SEO has been abused by search optimizers for years. This is probably why Google doesn’t put a lot of weight behind SEO keywords in footers. So don’t overdo it. Just use the phrase once as text, not a link, and move on. The footer of the Commission on Rehabilitation Counselor Certification website includes their code of ethics, which happens to include two of their most important keyphrases. These little logos instill confidence in visitors. They are a form of social proof and a powerful way to leverage the “Halo Effect.” If you’ve ever won an award, adding the logo for that award to your footer is a quick way to add credibility to every page of your site. Nitel has won many awards over the years. Gathering up those logos and putting them together in the footer of the website, helps build trust in a very competitive industry. Certifications also come with logos. Here are a few that often appear in footer designs. Adwords certifications for digital marketing firms. Membership has privileges. One of those might be a logo that can be used in a footer. Chambers of commerce, industry associations and even online directories can provide logos that look good in a footer. Cookies By Design shows their associations in the lower right corner of their footer. The best testimonials support the specific marketing claims of the page they’re on, so they’re not added generically to the footer on every page. The worst place to put testimonials is on a testimonials page. Check your Analytics, visitors just aren’t visiting that page. The Jody Michael Coaching website includes a testimonial at the bottom of every single page. It’s right above the footer, allowing for a different testimonial on each page. If you’re active in content marketing, you can give your site a “pulse” but having your latest content pushed directly in your footer. Solar Fuels Institute does this on their website, along with the social widget. 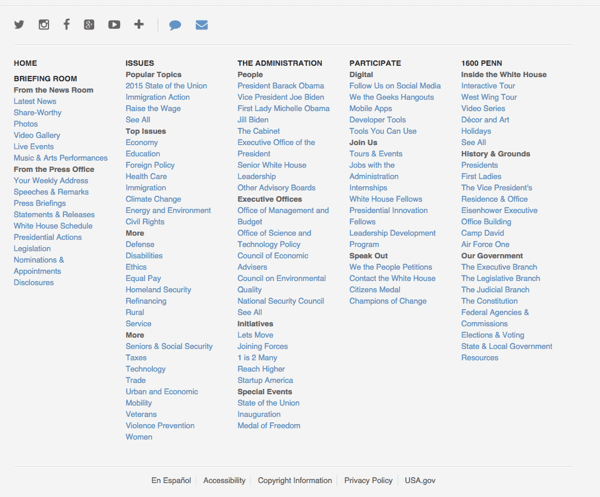 Or you may want to control which articles are featured in the footer. Then you can select those that answer common questions for visitors, or those that convert visitors into newsletter subscribers at the highest rates. If you run a lot of events, the footer is a good place to promote them, since anything in the footer is likely to be seen. But don’t add this unless you always have an upcoming event, or you’ll have a hole in your safety net. Text is overpowered by images. Images are overpowered by video. As a general rule, video is the most compelling format for content. So if you really want to go all out in your footer, add a video. The Marie Forleo website takes full advantage of video, include a video enhanced footer. It’s rare but possible to add an audio file to a footer. If anything it would likely be a clip that you’re repurposing from somewhere else, such as a radio spot. 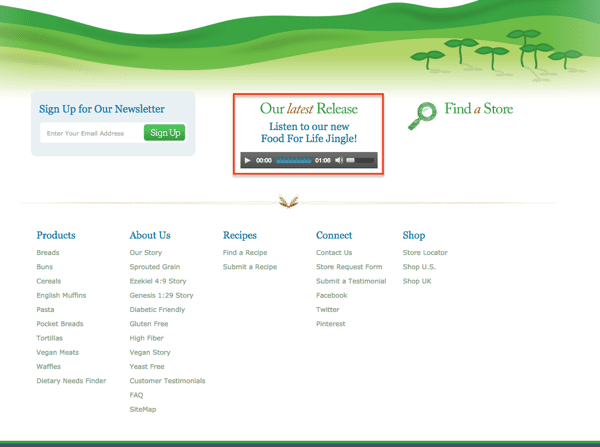 The Food For Life website embeds a little audio player with their jingle into their footer. Charming! Every marketing page should have a call to action. So adding one to your footer is a way to make sure it appears everywhere. You should never leave visitors wondering how to take that desired action. The Writers Theater website follows best practices for nonprofits by adding a prominent “Donate” button to the footer. When website designing a new website very easy to have a colour that you "think" you're attracting people to the site. Colour of a site is very important. website design Karachi is very much like your shop window, so thought and strategy need to put into as well as the user journey. Really a good article to read! There’s a particular website which I would personally recommend to checkout and that is City Tech. They are real professionals and provides quality services. WordPress donation plugin measures the performance of your donation campaign over various campaigns. You can create custom donation forms on your WordPress site and use numerous options for customizing goals.